From outrage, to revolution, to supremacy, then to global undreamed heights, this is the story of the meteoric rise of the Tang. This is also the story of its foremost prince, as well as the story of the early dynasty's most fabled unit. Within a single generation, all of China, all of east Asia was irrevocably changed. An enlightened monarch: Prince Li Shimin was an endlessly curious scholar who was also capable of extremely bold moves. He possessed a shockingly liberal mind that tolerated nearly all forms of criticisms and innovations. He was also a lifelong advocate of religious tolerance and multi-ethnic plurality especially after he ascended the throne as the Taizong Emperor. Aside from his frank rationalist outlook, he was equally known as the single most dangerous Chinese general in the years between the fall of Sui and the meteoric rise of Tang. For he was credited with destroying nearly all of his clan's sworn enemies while leading from the front. 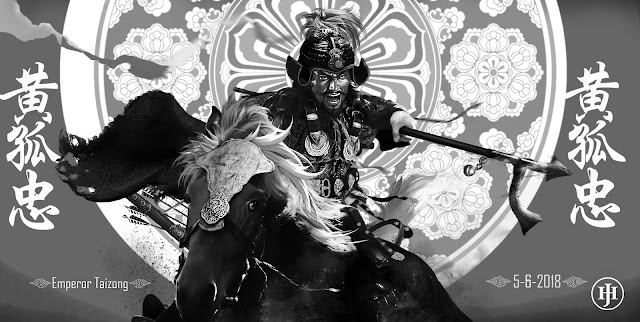 The 玄甲军, or "Jet Black Armored Cavalry" would serve as his bodyguard throughout his rise to power. 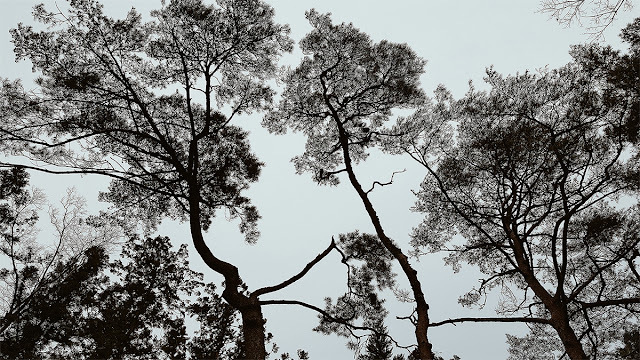 The story of both, as well as the fortunes of the newly proclaimed Tang dynasty are inextricable connected. The watcher on the walls, the shield that guards the realm. The Taiyuan region (Modern Shanxi Province) was tasked to act as the shield of the realm against repeated Gokturk invasions from the steppes. Their missions included manning the leftover defenses along the old Great Wall and training skilled native cavalry that were able to contend on an equal footing with the the hitherto invincible Gokturk cavalry. Our story began at the northernmost frontier of the strife- ridden Sui dynasty. The year is 617 and the realm is in great calamity. 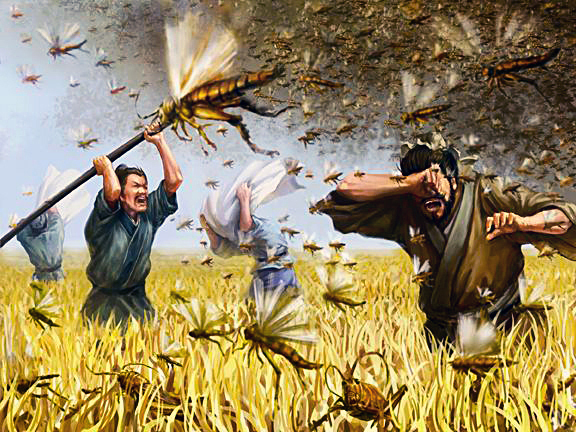 Revolts by starving peasants are everywhere, and the Sui Emperor's army have turned their weapons against the populace instead of rendering aid to the suffering regions. But for the defenders who currently occupies this northern-most front in the Taiyuan region of Shanxi Province, they had to both contend with a realm in chaos as well as the ever present threat of barbarians beyond the walls of their Great Wall garrison. 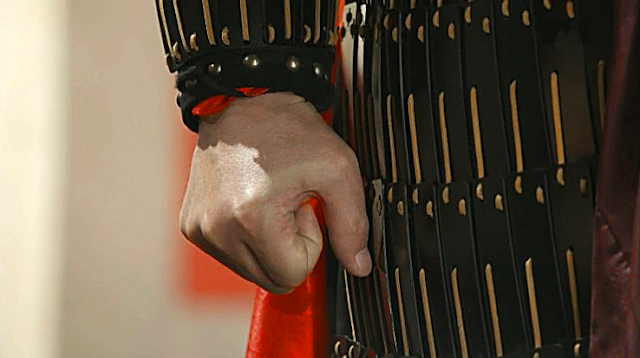 All would at least be manageable if not for the fact that the Emperor's inner court was plotting to slay the commander's entire family. It was also here that the commander of the garrison contemplated the impossible: the overthrowing of the paranoid Sui emperor and establishing his own dynasty. Within one year, this governor, Li Yuan would have risen to the height of unimagined power, his sons and his daughter would have not simply won him the throne of of the capital but also the Mandate of Heaven across the entire realm as well. In this story, we will see how one family unseated an empire and became the new undisputed superpower of East Asia. Jutting out as one of the northermost of the Sui defenses along the boarders of the Eastern Gokturk Khaganate, Taiyuan served as the gate into China along the Great Wall line of defense. 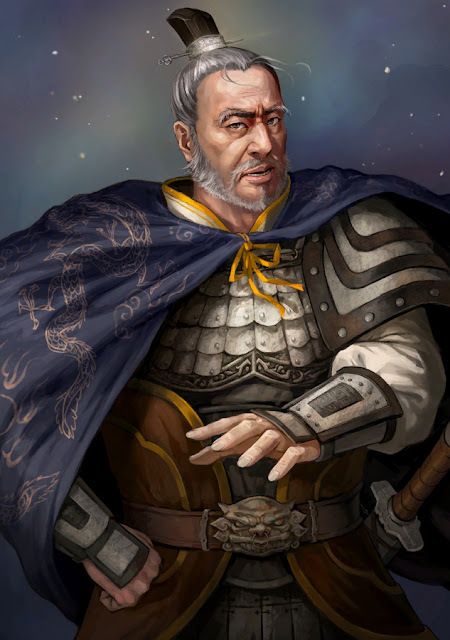 Thus it was critical that the commander appointed here be both a veteran commander as well as connected with the Emperor. Li Shimin as his aide-de-camp and secretary. With the core conflict of our story established, we must rewind our story a bit to before the chaotic nightmare of 610s. We must rewind the chain of events to when the protagonists of our story were still on perfectly good terms with the Sui imperial court, trusted and beloved before calamity plunged all into chaos. The year is 598, a full 18 years before the great conflict that was going to wreck havoc across China, and we follows the footsteps of the man who would eventually be appointed as governor of this barren military frontier, the Duke of Tang: Li Yuan. A faithful Buddhist and Taoist (Li clan traced its lineage to Laozi himself, whose name was Li Er,) Li Yuan and his children readily embraced a tolerant and pluristic view of religion and ethnicity. The Li clan could also trace its lineage to Xianbe (Proto-Mongol) princesses and generals who served various regimes of the Northern Dynasties. Li was perhaps one of the most respected old bloods in the entire echelon of the Sui dynasty. Not only was he a personal friend of the founding Emperor Wen of Sui, but by chance, he was also raised together since childhood with the man who would one day succeed throne after Wen. 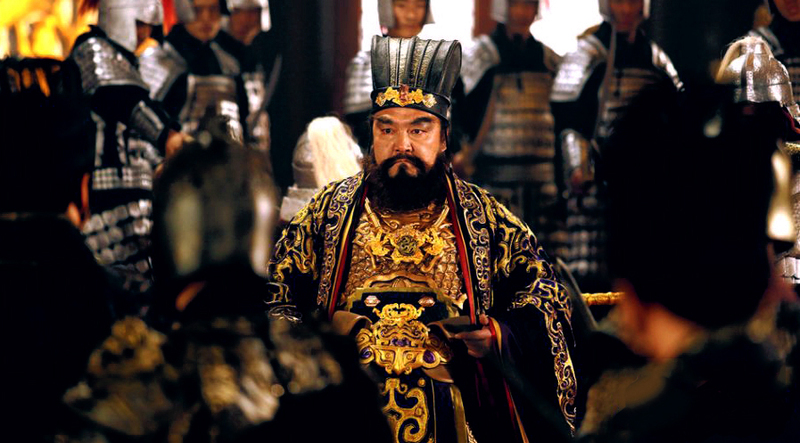 Thus he was known to both of the Sui dynasty's rulers on a personal level.  The saying 文武両道: or "Civil and martial both ways" or "Civil and martial mastery" describes the essential need for the ruler to staff his regime with great warriors and able bureaucrats. 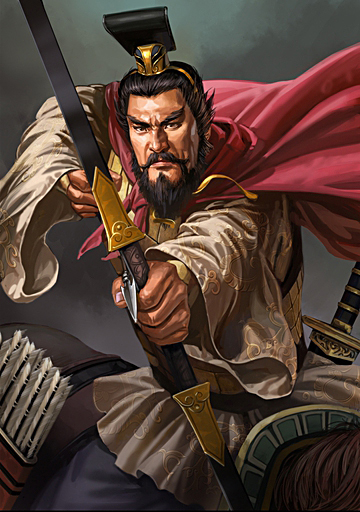 Li Yuan came from the best ranks of northern China's warrior- aristocracy and was foremost a man of ability proven in both war and political acumen. It was for these qualities that Duke Li Yuan was repeatedly posted as both governor and general across various parts of the empire. During Emperor Wen's reign would be posted more than 3 times as governor. Each of his tenure would be with completed with high marks. Well versed in academics as well as familiar with the civilian governing, Li Yuan was also one of the dynasty's most reliable generals. Even before Emperor Wen seized the throne from Northern Zhou, both respected each other as veteran generals of the Northern Zhou regime. After loyally serving Emperor Wen throughout Wen's life Li Yuan would also follow suit with Wen's son, personally contributing and rendering aid to several of Emperor Yang's disastrous campaigns. But Li Yuan's most powerful assets, from a historian's view was the fact that Li was a great father to his children. Li Yuan was known to have had 41 children, 22 sons and 19 daughters in total. And from one particular Duchess Dou, Li fortuitously received 3 highly talented sons and 1 extraordinary daughter. All of whom would go on to personally lead Li Yuan's armies in the future and all be preserved in the annals of Chinese history. For our narrative, we will focus specifically on Li Yuan's most talented son: Li Shimin. It was this particular teenager Li Yuan would pass on his most intimate knowledge of war-craft. Handsome, athletic, and endlessly curious, many adults noticed from an early age the great potential of Li Yuan's second son. Li Shimin 李世民 was blessed not only with a quick mind but also a simultaneously charming name that bellied great ambitions: his name "Shimin" was a shortened form of the Buddhist prayer "save the earth and gave the people peace" (濟世安民, jishi anmin,) or more shortly could be translated as: "Li- the citizen of the world," "Li- world's folk." Many noticed that the boy possessed two very keen aspects, one of complete detachment in silence while he is deep in his thoughts, another of easy going and jovial candor. As a boy he loved to engage conversation on nearly all topics and barred no subject as taboo or superstitious (in contrast to most of the northern Buddhist nobility, who believed in witchcraft and Karmic curses.) Though a frank rationalist, he nonetheless deferred most respect to teachers and anyone who possessed talents and intellect. It was little wonder that many teachers flocked to his manor to teach him on all subjects. It was also because of these very social grace that Li Shimin would one day become his father's spy handler and spymaster, unofficially tasked to befriend and gather all the talents across the realm for the clan. When Li Shimin was only 16, events transpired that would place him at the forefront of Sui's imperial politics and see him winning the very appointment that placed his father on Taiyuan front. In 615, during his imperial tour of the northern frontier, Emperor Yang and his entire court was ambushed and trapped by Eastern Gokturk forces under their Shibi Khagan (Khan) at Yanmen Commandery (present-day Shanxi- right within the Taiyuan front) which Shibi Khagan and his army would immediately put under siege on September 11. 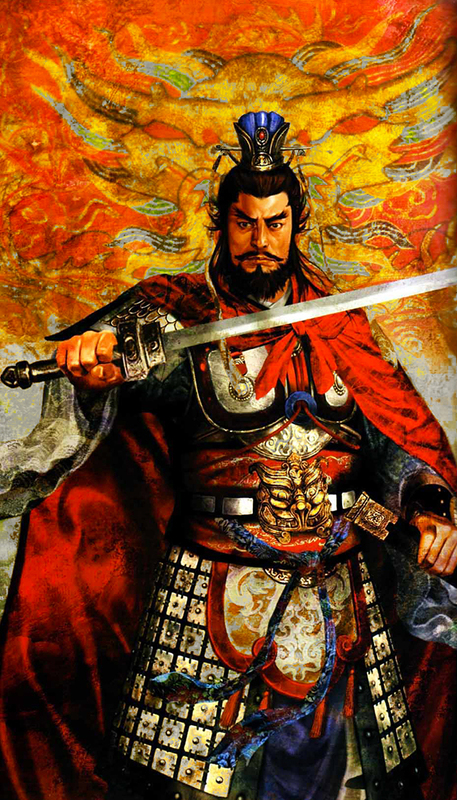 Li Shimin would mount up along with his father and personally ride out to relieve the besieged Emperor. 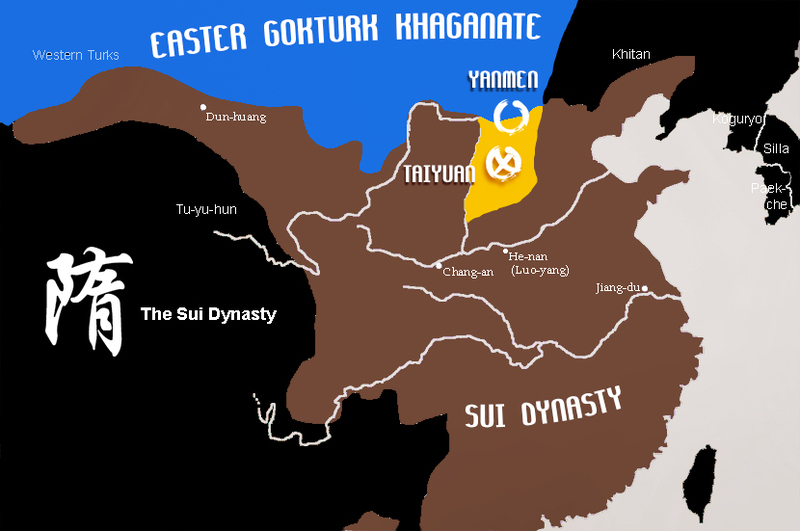 The Gokturk empire was one of the greatest superpowers of 6th century East Asia. A century before the Tang, Turkic people had established a sprawling state along the entirety of the Eurasian steppes stretching from Manchura to the Crimean shores of modern Ukraine, flanking the entire back of the Sassanian Empire, to end only at the boarders of the Byzantine Empire. During their expansion the Gokturks also vigorously invaded and plundered northern China first against the Northern Zhou, then the Northern Qi. But by the dawn of the Sui dynasty, their strength was greatly weakened. A massive civil war which spanned 20 years broke out due to succession disputes and split the Gokturk realm into two halves. However by the reign of inept Emperor Yang of Sui, their strength was mostly restored. When the great disaster was reported across the Sui realm, very few generals and their retainers wished to render aid to the stranded Emperor Yang and his court. For brevity's sake it should be mentioned at this point that unlike his well respected father (the late Emperor Wen,) Emperor Yang by contrast was perhaps one of the most reviled monarchs in all of Chinese history, whose own reign produced much suffering and hatred across nearly all sections of the empire. And although we would elaborate on the details of his disastrous rule below, for the time being we should know that right before Yang was trapped by the Gokturks, he had caused several millions of Sui citizens to die on extremely unpopular projects while he and his inner court gorged themselves on great feasts. Emperor Yang also dallied with frivolous leisures like building dozens of unoccupied giant palaces and constructing mammoth state subsidized pleasure barges while the peasants died in untold numbers. Corpulent, paranoid, utterly apathetic to the plight of the peasants...as well as completely distracted by the pleasures of his harems, Emperor Yang was not only known for his many disastrous projects that left many millions dead but also for his wasteful excesses. However, when Yang was trapped, he seemed to have had a change of heart. It was said that Emperor Yang became so fearful that he cried all day long while holding onto his youngest son Yang Gao, the Prince of Zhao. He also wrote out piteous confessional letters to many of the generals in the realm explaining that he was wrong, he had ruled badly, that he had not treated his stalwart servants well. 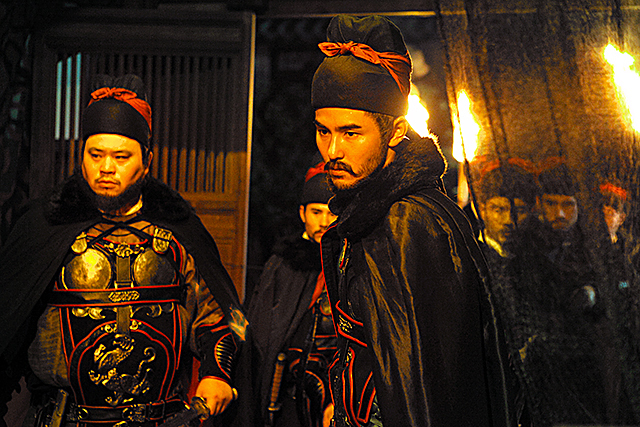 A general call was made for men to join the army to help rescue the emperor. Yang pleaded that should he be saved, he would rule anew with honor. Yang also personally visited the soldiers defending the city, raising morale by promising to end his wasteful military campaigns and to reward them with hoards of honors and treasure. 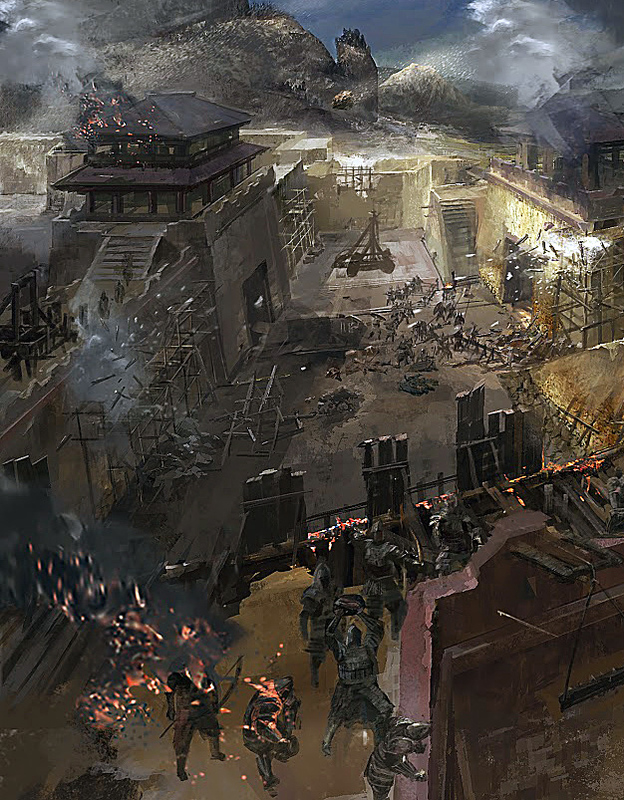 Each day Yang was trapped in the fortress, the Gokturks encroaches closer, killing the city's defenders and Yang's bodyguards, each day he was closer to becoming a Khan's slave. Li Yuan and Li Shimin would become some of the first Sui loyalists who reached the trapped Emperor and rendered aid to the defenders. Shibi Khagan soon lifted the siege and withdrew north. During Li Shimin's service he trained under the veteran general Yun Dingxing (雲定興) a warrior of one of the elite "Soaring Hawk" cavalry regiments of Sui. Apparently despite his age, Li performed his tasks with distinction. Here Li's skill as a horseman was attested as well as multiple accounts of his expertise with a variety of weapons. Together with a dozen other loyal generals who answered the desperate imperial call, they rescued Emperor Yang and escorted him to safety. 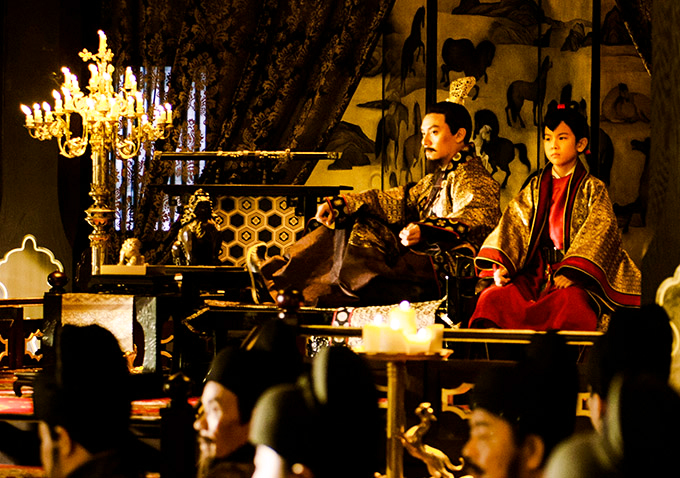 But, surprisingly to both Li Yuan and Li Shimin it was also here that Emperor Yang showed his true colors. 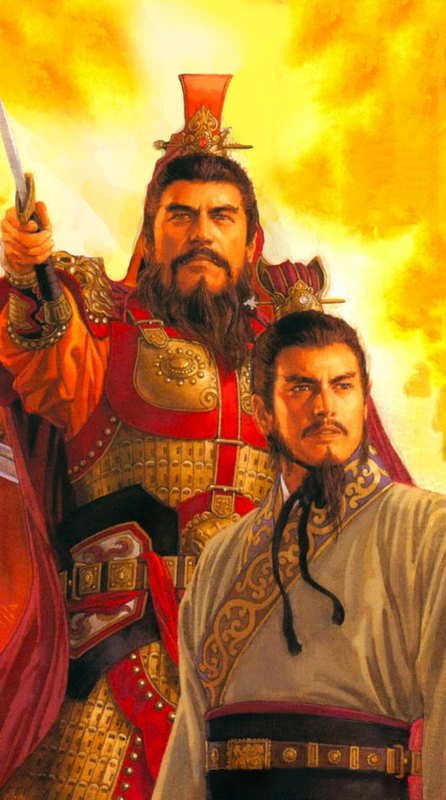 With the danger passed, Emperor Yang reneged on nearly all of his promises: he continued to prepare his disastrous construction projects and to launch another one of his extremely disastrous military campaign against the northern Korean kingdom of Goguryeo; he did not bestow any monetary rewards on anyone within the Yanmen garrison or any of its reinforcements; he was also sparing in the promotion of the officers who came to his rescue. When generals Fan Zigai and Xiao Yu reminded him of his imperial promises, Emperor Yang rebuked Fan and demoted Xiao Yu. What was more unthinkable (perhaps to a modern mind, but this was quite in character of Yang) was that he immediately launched a massive political purge of all the officers who did not show up in time to his rescue, sometimes not only executing the officials but also their entire families as reprisals after brutal tortures and posthumous exhibitions. The realm, which was already suffering by the millions by Yang's misrule now suffered his additional tortures. On top the this unilateral display of dishonor and cruelty, Emperor Yang went back to his pleasure addled, wasteful indulgences and left all the famine stricken sectors to survive by themselves. To make the matters worse, even when the Gokturk Khagan pulled up stakes and retreated north, his influence did not leave with him. Instead, he paid more than a dozen disgruntled Chinese agrarian rebels who hated the government to roamed the countryside as rebels and bandits to continue to harass northern China in a constant proxy war not unlike the contemporary Russian backed rebel forces in eastern Ukraine. 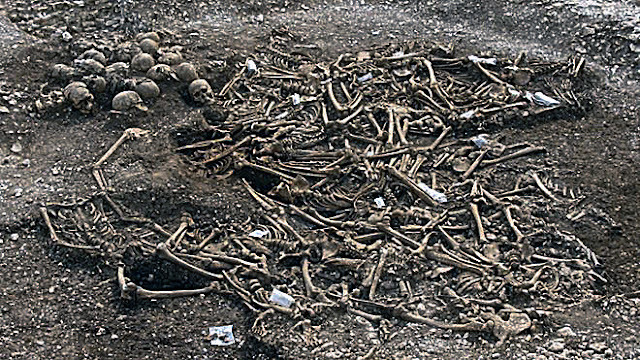 The imperial granaries were plundered and whole regions were left to starve, with such starvation, more flocked to the rebels and turned their swords against the Sui forces. Like the ancient Chinese stratagem 以夷制夷 goes, "use barbarians to control barbarians," in this case the Gokturks reversed it and instead used the "Chinese to control the other Chinese." Every year that followed, northern China was rife with desperate rebels and death was ubiquitous on the boarders. 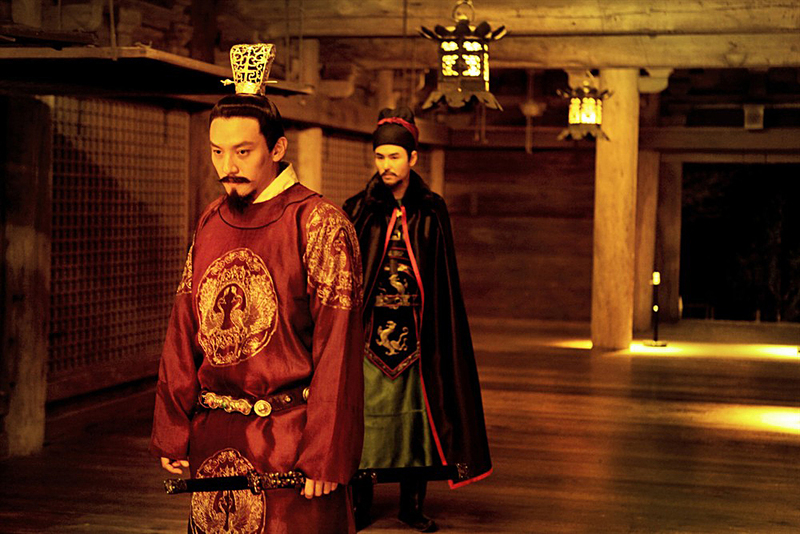 However, one of the generals who miraculously escape from Emperor Yang's national purge was Li Yuan and Li Shimin. It was because of Li Yuan's timely relief of this problematic realm's gate that Emperor Yang appointed Li Yuan as the warden of this very northern garrison. In 616, Li Yuan was officially put in charge of the important city of Taiyuan at the center of Shanxi. 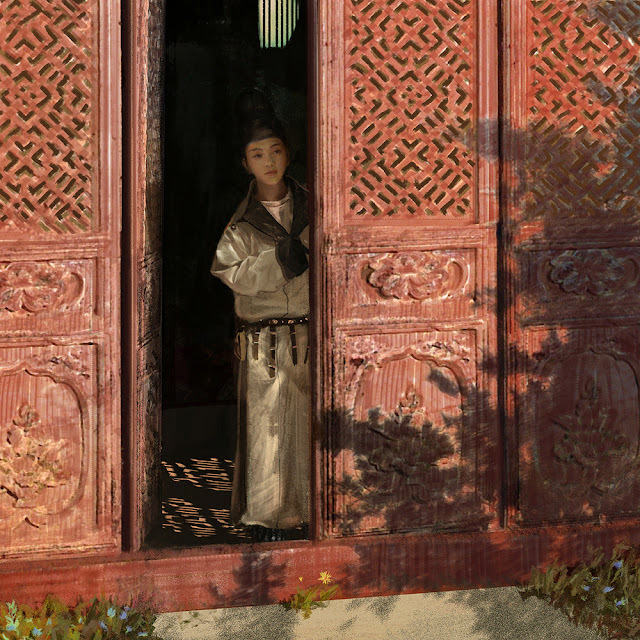 Li Shimin- per his station as a soldier and the clan's cavalry general followed his father there as well, leaving his three other brothers—Li Jiancheng, Li Yuanji, and Li Zhiyun (李智雲, by Li Yuan's concubine Lady Wan)—at the Li ancestral home in Hedong (河東, in modern Yuncheng, southern Shanxi beside the Yellow River). Middle: A map of the Tang garrison (yellow) in modern Shanxi right between the Sui empire and the Gokturk Khaganate, Taiyuan and the northern gate of Yanmen marked in white. Its strategic position as the entrance into northern China could not be overstated. 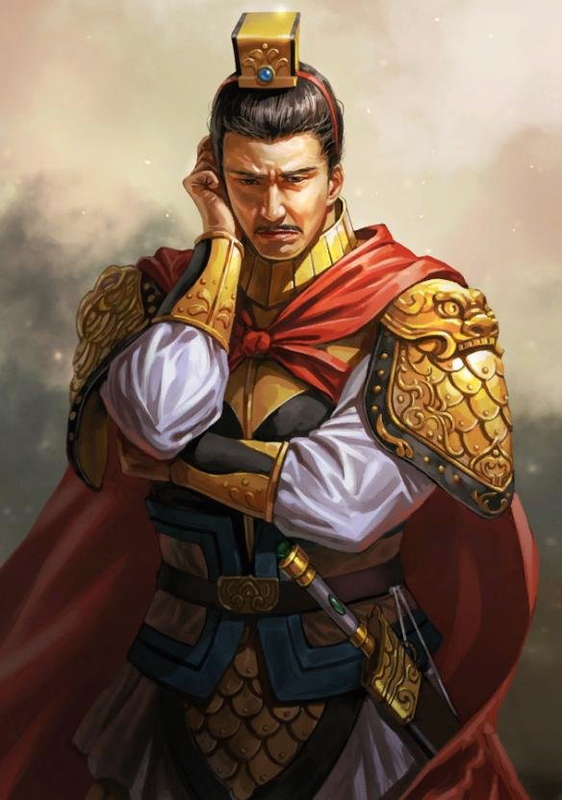 Li Yuan was tasked with defending against any and all possible Turkic incursions and put down the endless respawning rebel armies surrounding the Taiyuan frontier. Thus sandwiched between the howling terror of the steppes and foreign- backed guerrillas. The backbone of his cavalry were all elite "Soaring Hawk" regiments. They were the best cavalry the Sui fielded and could contend with the nearly invincible Gokturk cavalry on an even footing. 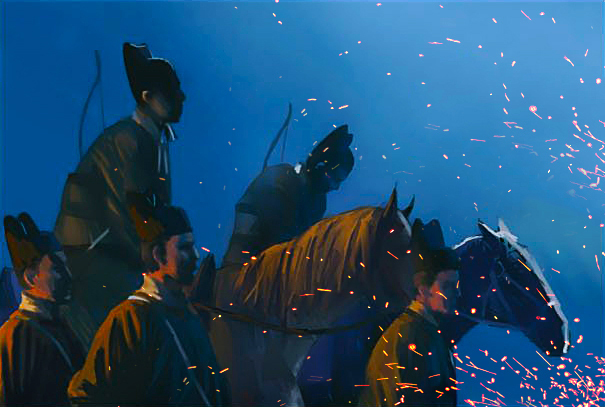 When Li Yuan would one day raise his own banners in rebellion, most of his forces would be composed of some of the best drilled light cavalry in the entire realm. It was also here in Taiyuan that Li Shimin raised his own elite cavalry called his own 玄甲军 "Black Armored Army," or his "Jet Black Armored" cavalry from his best 1,000 riders. 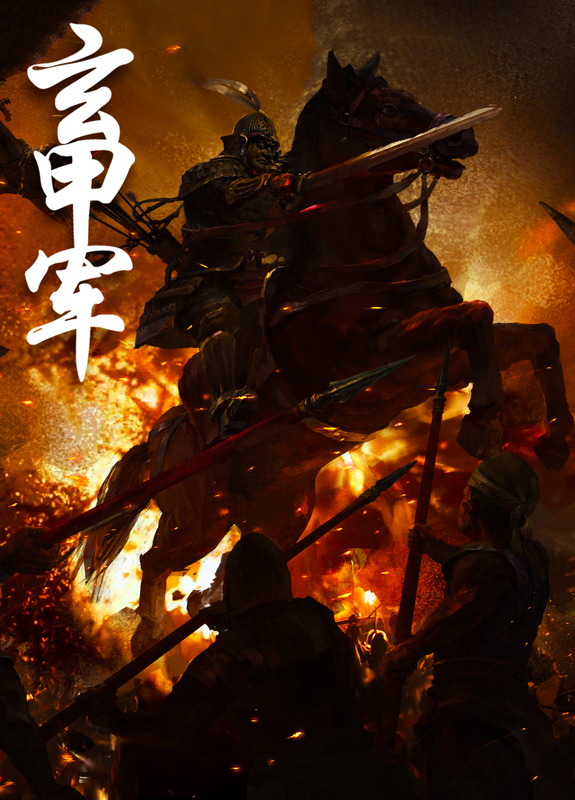 During Li Yuan's tenure as the warden of the northern frontiers the best of his army were the elite cavalry units under the leadership of generals Qiu Xinggong and Duan Zhixuan (both veterans of Sui wars against Korea,) the others were the horsemen gathered around Li Shimin. 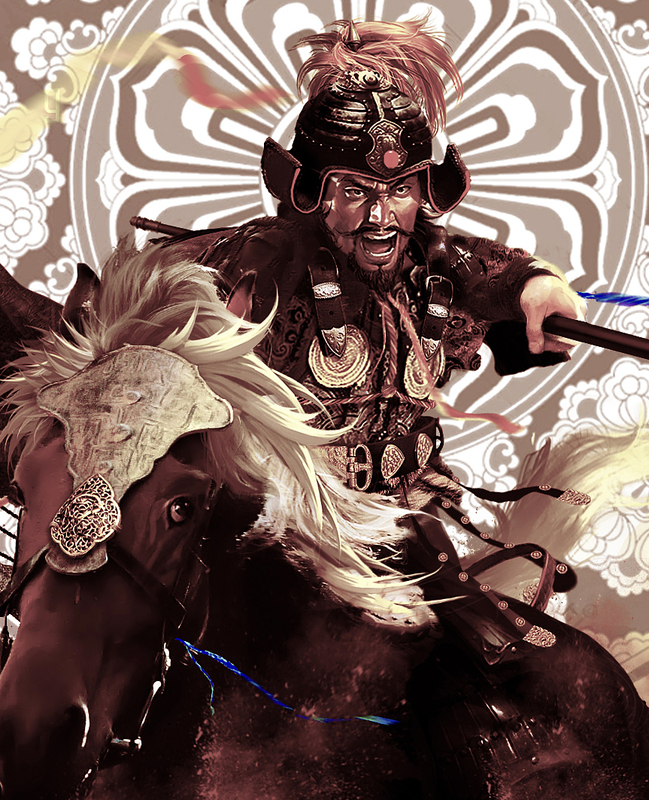 In the course of Li Yuan's experience fighting the nimble Gokturks cavalry, he reverse engineered many of the Turkic manner of warfare. In time, the ways of east Asian's best best cavalries were further perfected and passed on down to Li Shimin who familiarized and micmicked his father's strategems. In order to distinguish his personal elite vanguard as a unit, all of the soldiers of the bodyguard was issued an ornate black armor with colorful lacework. For each of the coming battles Prince Shimin would wade in, he would donne on his own black armor and fight near the vanguard of his cavalry. Soon, the Jet Black Armor Cavalry would be simply referred to as his "black troops" 玄军 or his 黑军 "blacks." One of the critical advantages of such unit is that the mobility for the Blacks was very strong. Many times if they were not able to make direct gains they would wheel about and make a roundabout flanking maneuver. Another advantage is their capacity for long distance campaigns and prolonged pursuits. 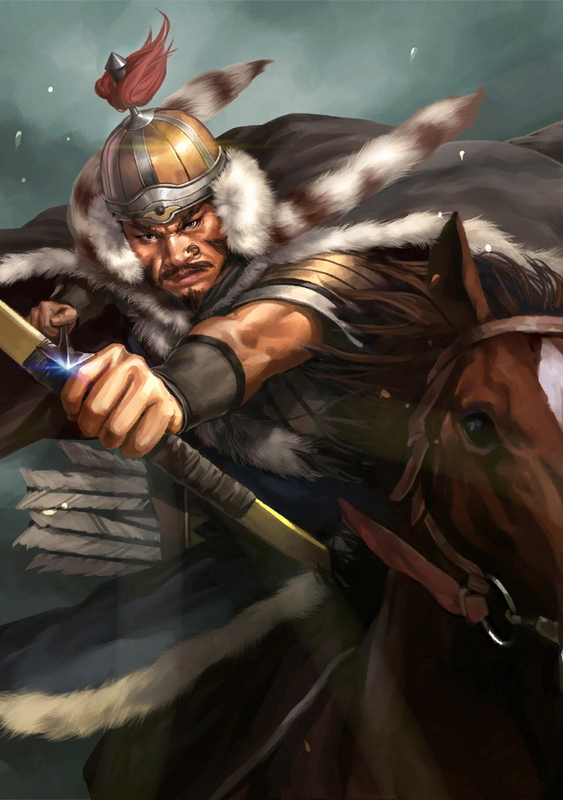 In the campaigns against generals Xue Renyi and Liu Wu Zhou, there was a record of long-distance chase, in the pursuit of Liu Wu Zhou, after breaking through his lines, the Blacks were able to chase him for more than 3 days in a row. In order to further maximize this unit's dangerous range and maneuverability, Li Shimin sought out to double the capability of each of those areas. Li Shimin equipped one soldier with two horses each. 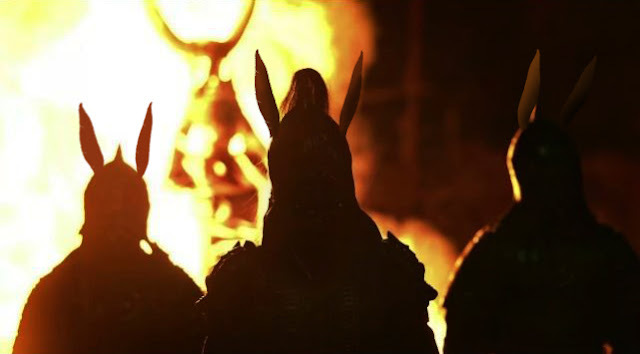 Out of his 3500 horsemen, he gave 7,000 horses to each, including horses provided from the Gokturks. With this, even autonomously, the Blacks were able to achieve long-range deep raids by themselves. All of these great attributes would make them (and Li Shimin himself) virtually uncontested on the battlefield in the chaotic realm wide war to come. 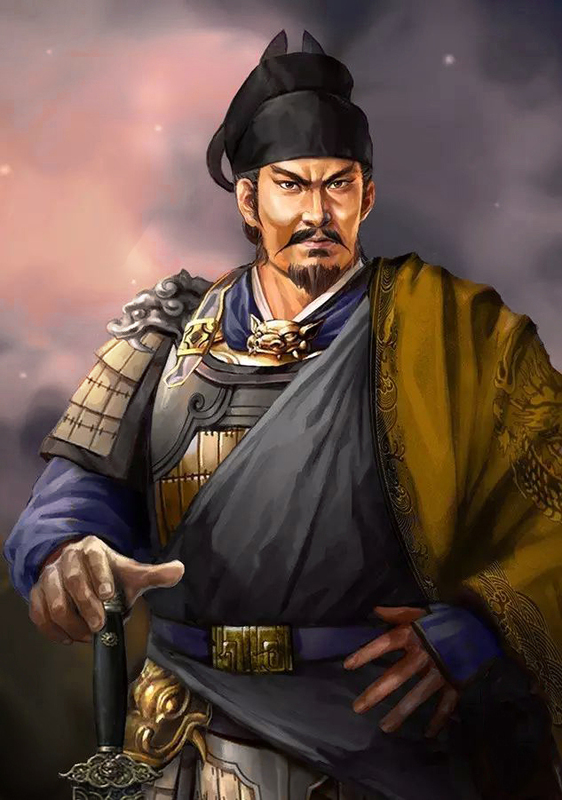 We have already discussed the dishonorable true colors of Emperor Yang in the previous segment, but now, we should examine exactly how Li Yuan (the commander on the frontiers) would come into direct contact with this despised tyrant reviled by half of the realm. So who exactly was Emperor Yang? 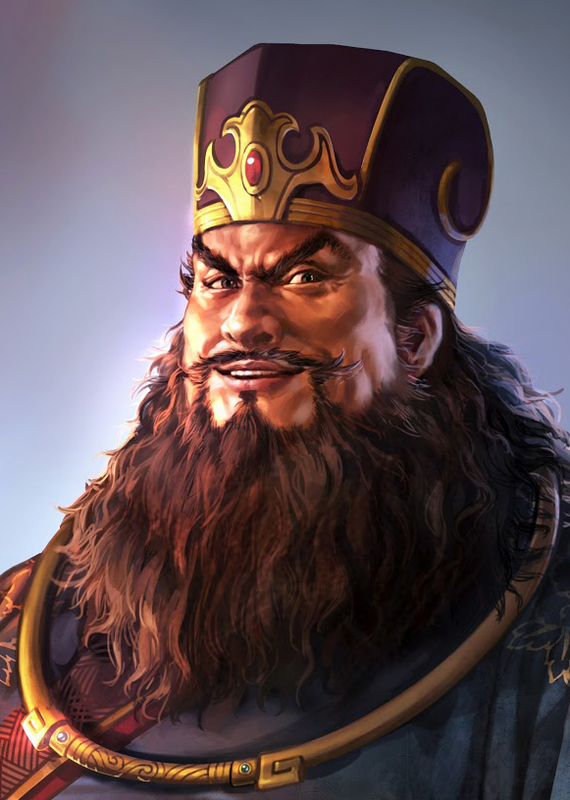 In 604 AD, the able and much respected Emperor Wen of Sui died suddenly at his vacation palace (likely assassinated by Yang himself because he was able to immediately spring a series of elaborate assassination ploys and kill his brothers in the aftermath.) The Sui throne, which had then been at once efficient, lenient to the peasantry, and militarily capable was passed down to this- one of the worst tyrants in Chinese history. Vain, paranoid, and utterly decadent, the corpulent Emperor Yan was a world away from his father. Spending days and nights drinking, feasting, and indulging in carnal pleasures he drained the treasury with his excesses while he neglected the affairs of the state. During his negligence giant pockets of the realm starved until there were simultaneously dozens of rebellions across his realm. Untold millions died of starvation and was forced to resort to banditry while the Sui apparatus failed to render aid and often simply resorted to violent repression. 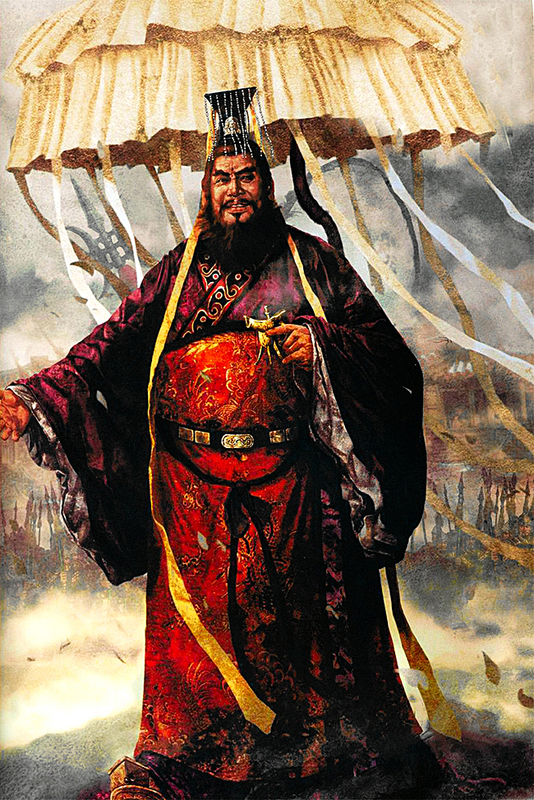 All the while reports of the nightmarish conditions were never filtered back to the Emperor because he was constantly surrounded by a cabal of sycophant ministers who portioned the realm among themselves, deepening their pockets while fooling Yan with their honeyed lies. It was for this reason that many governors did not dare to report the truth of their local provinces, and why only a handful raced to retrieve the besieged Yang. To compound his negligence, Emperor Yan also started many extremely unpopular policies, namely, he conscripted millions to invade Korea and Sui's surrounding kingdoms with massive humiliating losses and forced many millions away from their families to build the giant Grand Canals to link up the Yellow River with the Yangtze. Millions too would die in those harrowing construction endeavors, again- largely unreported to Yang because of his corrupt inner circle, all left unmourned and utterly broken by the rigor that was collectively forced upon whole communities. Characteristically, more regions went up in rebellion to protect themselves from the tyrannical government, characteristically to Emperor Yan too- he would unfailingly send columns of the Sui soldiers into the troubled area and utterly slaughter whole regions that rebelled against his dreadful edits. It was obvious to all in the empire that the Sui, previously great and worthy under the founder Emperor Wen was already brutally undone within a single generation. It is with this understanding that we return to when Yang and his court was trapped by the Gokturks at Yanmen Commandery in 615. It is also with this knowledge we could understand why so little of Yang's generals rushed to save him at all. 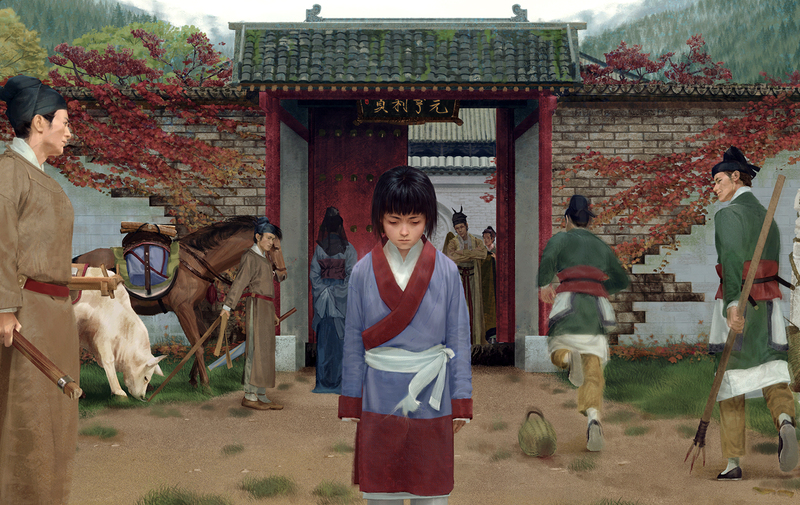 Though the likes of Li Yuan and Li Shimin would save the Emperor's life, many- even the loyalists who had went forth to deliver Yang from danger would come to regret their former loyalty. Yang would even try to destroy those who came to save him at Yanmen as well. After the incident, the man who was released back to his absolute authority not only reverted back to his inept ways but also increased his cruelty. Yang's wasteful palace constructions projects resumed by the dozens, his disastrous military campaigns against Sui's neighboring kingdoms resumed all while great numbers of peasants continued to die in record numbers. Thus it was not uprising at all when the inner court enemies of 李 李 李 Li Yuan named him too as a potential threat to Emperor Yang's rule, citing a list of troubles Li Yuan's been having at Taiyuan, that our Duke of Tang silently issued orders to his children to join him on the frontier for a calculated rebellion that would unseat Yang and his entire cabal. Time is now of critical concern to both Li Yuan and his family, lest they became another clan that was collectively executed and have their heads gibbeted on Chang An's walls as traitors. Li Yuan not only had to contend with the great mesh that was slowly closing in on him from but also worry for the safety of his children. 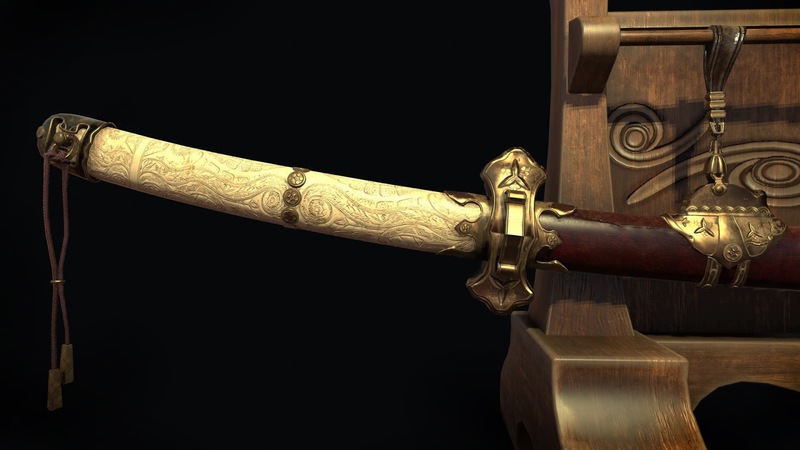 To make sure all of his children would be close to him and far out of harm's way, he wrote to both his daughter and his son-in-law Chai Shao (柴紹) -a member of the imperial royal guard since both were still in the imperial capital at Chang An. Li Yuan recalled both of them to slip away and sneak back to him. He also issued orders that his eldest son Li Jancheng and third son Li Yuanji join him with all the other Li children and servants who were left in the governor's mansion at Hedong. At last, when he recieved news that his sons are safe on their way and met his son-in-law Chai Shao again, Li Yuan raised the banner of rebellion. Unfortunately Li Yuan's sons failed in their task and Li Jancheng and Li Yuanji left their 13-year-old brother Li Zhiyun along with several of the boy's servants behind. The Sui forces in Hedong quickly surrounded the compound and arrested the boy, then sent him to Chang An and had him publicly beheaded. 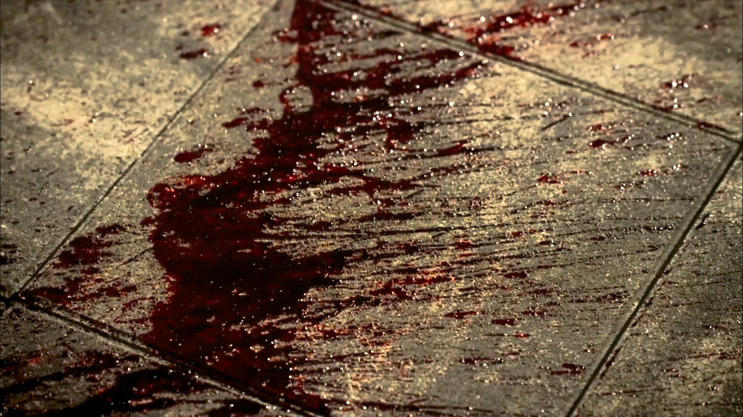 For the first time in our story, Li blood has been drawn. If anyone was still unsure of the degree of consequences when Emperor Yang's men get their hands on someone even tangentially related to his foes, this will be it. The battle of the tyrant Emperor and one of his best generals had just taken a more personal turn. The matter of Li Yuan's daughter (on her way back from Chang An) also took a rather drastic and unpredictable turn. 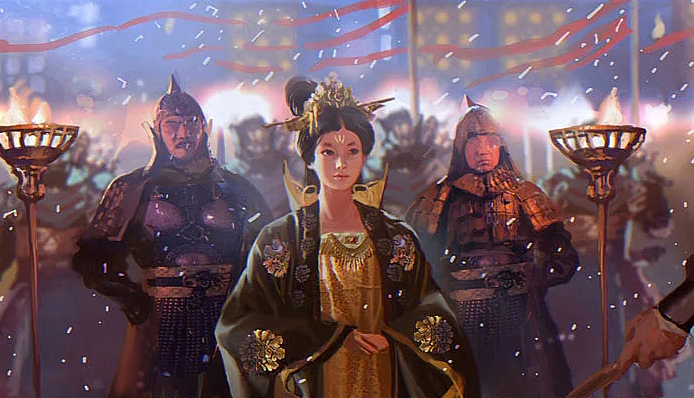 On her own initiative, Li Yuan's 17 year old daughter- the future Princess Pingyang raised her own army of some 20,000 rebels. She had seen the plight of the peasants on her way back to the family holdings near Shanxi and quickly ordered the granaries of the region be opened up to the starving peasants. She also sold all of her fortunes and family jewels that she took with her from Chang An and distributed them to buy more food to bribe the local bandit chieftans and rebel generals to her cause. All by herself, Pingyang began to take the various key cities beyond the Sui army's reach. For the time being, she possessed the only army that stood between the vengeful Sui government and her father's holds. 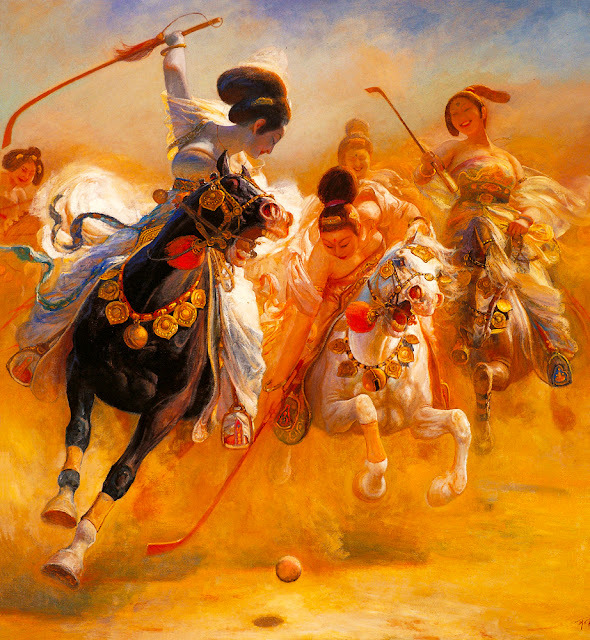 A Tang dynasty lady playing polo. 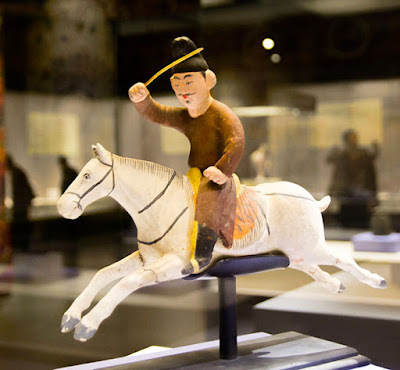 Tang dynasty was very much influenced by the liberal steppe traditions thus conferred a high level of freedom and political power to women unlike most of Chinese dynasties that both preceded and succeeded it. 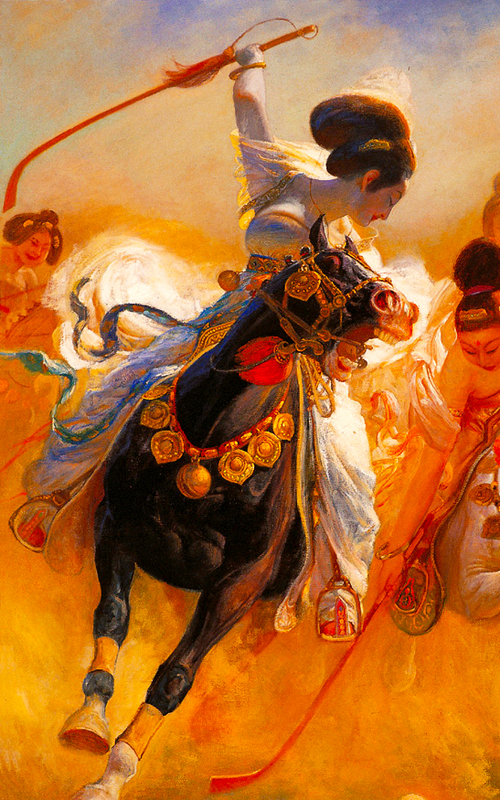 Such displays of loose fitting translucent robes and the spectacle of women riding with each other like athletic jockeys would have been utterly scandalous for the cultural mores of more conservative dynasties that followed the Tang. After Li Yuan declared his rebellion against the Sui Emperor from his base at Taiyuan, he quickly found himself in a double conundrum. The Emperor and the whole realm was now arrayed against him, but beside this ubiquitous threat, to his northern flank lies another monstrous waiting enemy (remember, he was the northern frontier's garrison commander) and beyond his walls still laid Shibi Khagan's war hungry Gokturk horde- which at any time could breach through Taiyuan and spill into the realm unchecked. Li Yuan's 17 year old daughter- the future Princess Pingyang raised her own army of some 20,000 rebels. She sold all of her fortunes and family jewels that she took with her from Chang An and distributed them to buy more food to bribe the local bandit chieftans and rebel generals to her cause. 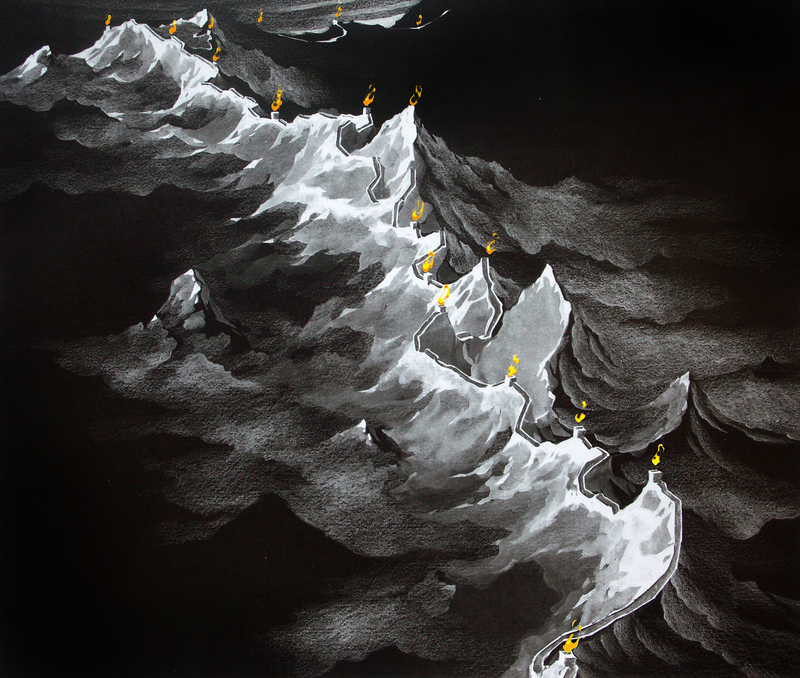 All by herself, Pingyang began to take the various key cities beyond the Sui army's reach. As a soldier, if he allowed a single hostile Turkic force to enter China unchecked he would have been regarded as not only a nominal traitor, as the Sui have already branded him, but an actual traitor through his failure. Thus Li Yuan made a move that quickly assured he would only engage one of his massive enemies at a given time. 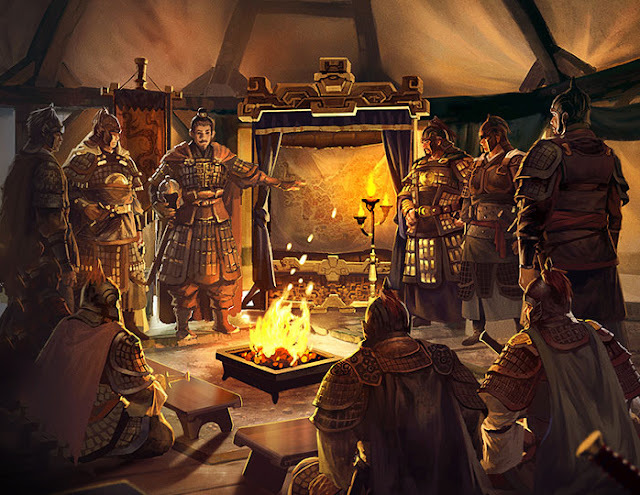 First offering a generous tribute and (feigning friendship) to Shibi Khagan, Li Yuan promised that should he ever take power in China (as the new Sui regent) he would render greater tributes to the Khagan annually. 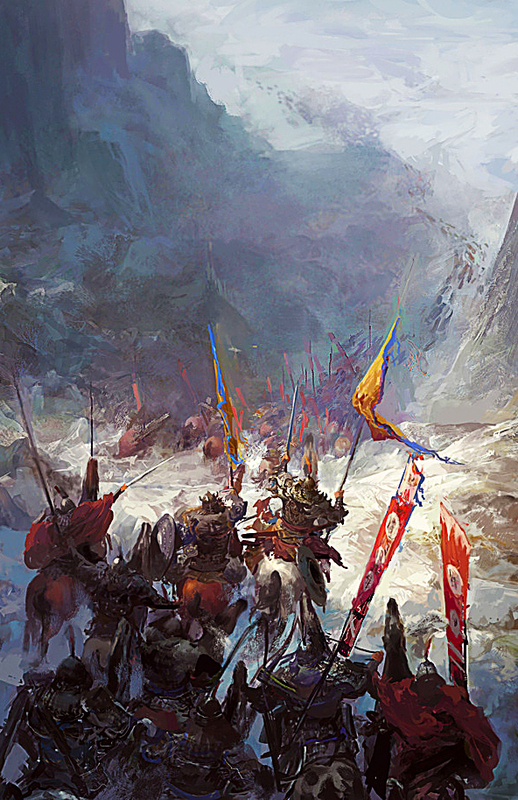 Miraculously, Shibi Khagan agreed and even sent thousands of his own soldiers for Li Yuan's undertaking. Perhaps miraculously is too dramatic of a word, especially when we analyze the context of the seesaw relationship between Sui and the Eastern Gokturk Khaganate up close. By 617, the Sui and the Gokturks have intensely meddled in each other's affairs for more than 50 full years, by the time of Li Yuan's rebellion it was almost a convention that whenever either Sui or the Gokturks would be wracked by a civil war, the other would opportunistically throw some trinkets to one of the warring rebel parties and lend their weight for the rebels to cause some headache. Remember from our previous records that Shibi Khagan was known to habitually fund Sui rebels all along the frontier hoping to weaken Sui defenses in the area and paralyze the Sui command. 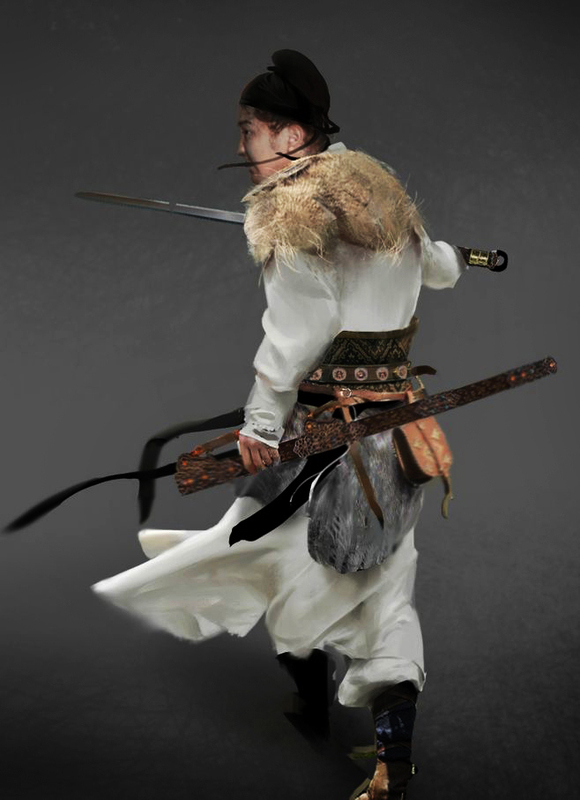 To the Gokturks, Li Yuan would have appeared as just one of the many Sui rebels looking to find a patron in order to cause some trouble for the Sui regime. 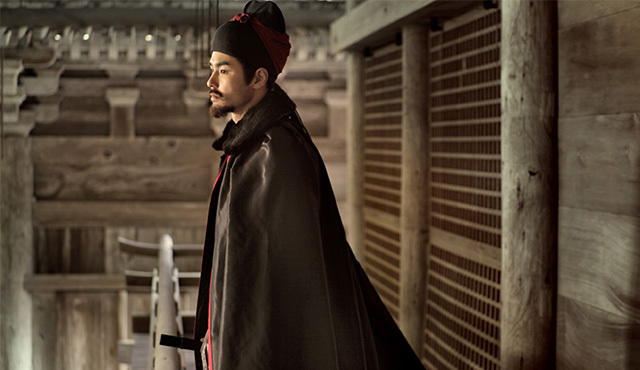 From the Gokturk perspective, if this Duke of Tang would persist in his little civil war, the Sui would be wracked in a realm- wide civil war, greatly weakening them as a whole. 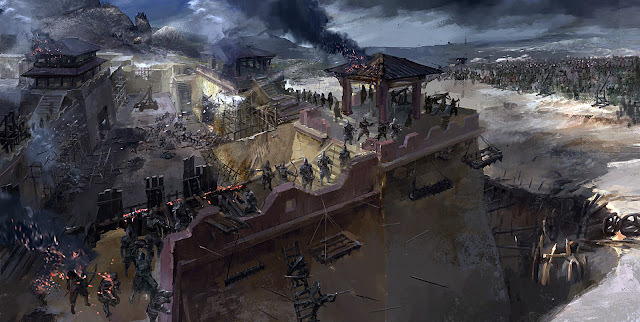 Equally, if the Duke of Tang would fail and loose most of his soldiers, the defenses along the Taiyuan garrison would be easy broken should the Khagan's forces attack it after his death. Either way it was a win- win for the Gokturks...Or so Shibi Khagan thought. Predictably, the Khagan immediately agreed to Li Yuan's proposition and even sent 2,000 horses and several columns of his own cavalry for Li Yuan's gambit. 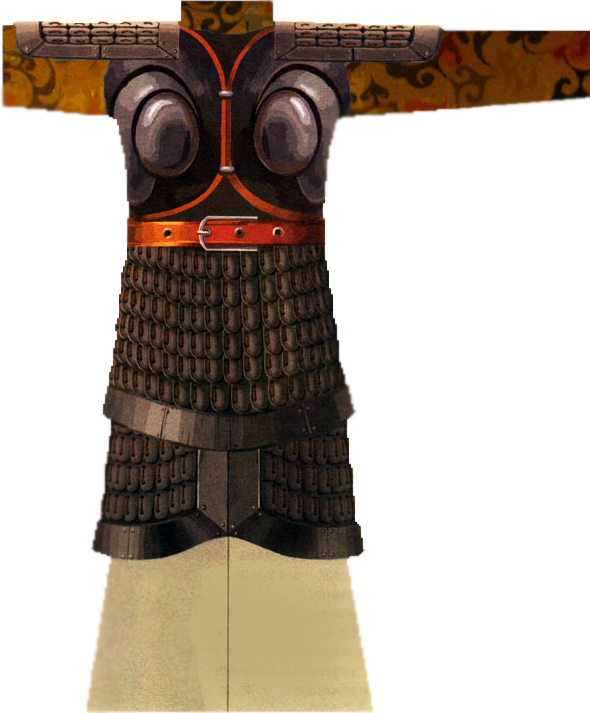 Shi Dalai, a general of the Western Gokturks, led the Gokturk soldiers to Li Yuan and placed them under Li Yuan's direct command. Thus light cavalry became the main soldiers of Li Yuan forces and thus too Li Shimin was able to give 2 horses to each of his vanguard. 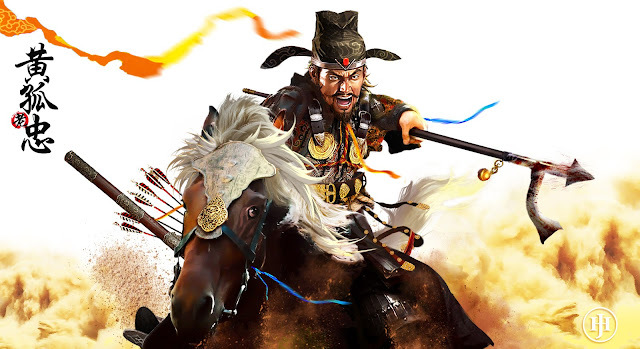 Among these quality riders, Li Yuan raised his two sons, Li Jiancheng (28) and Li Shimin (18) as major clan generals and ordered them to raise their own divisions as well. Out of Prince Li Shimin's thousands of assigned troops, he pooled the 1,000 most elite of the northern warrior- aristocrats into the Jet Black Armored cavalry. All of the Li clan was equipped and ready. Failure was not an option. For in failure, the entire Li clan would be slaughtered and hunted down by the entire realm until its last member was slaughtered like the families of so many other generals before. The gate of Yanmen would be breached by Shibi Khagan and his horde would spill right into China. There would not be a backward glance as they push toward the capital, each battle must be won, for failure would equal becoming dust, reviled, and forgotten. Having gathered the banners and having left his third son Li Yuanji in charge at Taiyuan with a small garrison, Li Yuan and his two sons advanced south toward the Sui capital at Chang An. They would face an entire empire and a wild rogue's gallery of generals and warlords in their meteoric ascension. 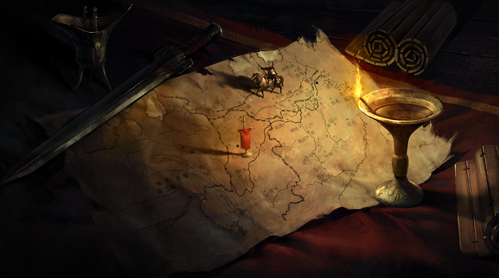 Join us next chapter to see a realm ablaze. Great articles so far about China's greatest emperor and some would say, greatest dynasty, the Tang. 1. 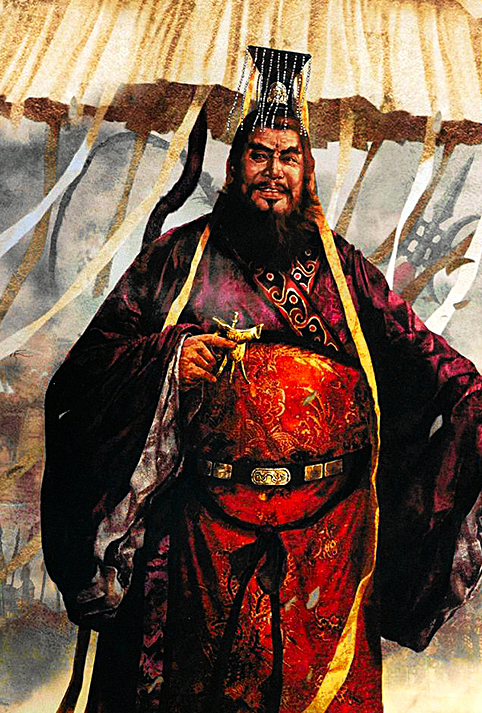 Do you think emperor Yang of Sui's 'tyranny' has been exaggerated over time? To make the Li's look better. 2. You make Li Yuan sound awesome, but what do you think of Li Shimin's eventual usurpation after killing his two brothers? Is it a black mark on the founder of the Black Armored Guard? In fact, because the Li's were of Turkic extraction, brother killing brother was common on the steppe and amongst Turks, look at the Ottomans. 3. Your story will eventually get to the fact that Li Shimin eventually defeats the Gokturks and crushes their empire and vassalize their people as the Orkhon Inscriptions say. He will also take the title of Heavenly Khan in some sort of 'Dual Monarchy' ... Emperor/Khan ... 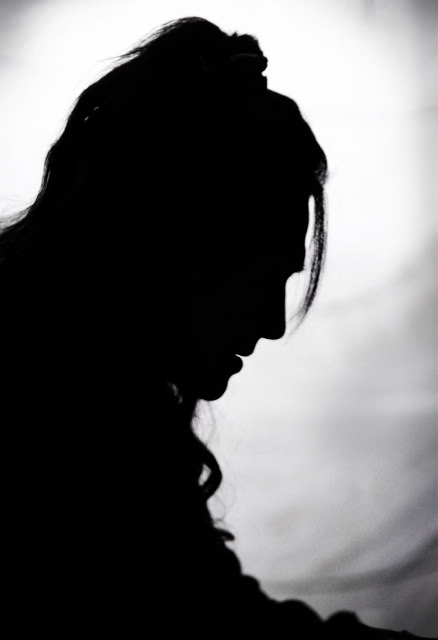 Son of Heaven/Child of Tengri. To my knowledge he was the only one, no subsequent Chinese emperors (with the exception of the Manchus Qings of course) took the title Khan after Li Shimin. Am I correct? I take much of Tang's grand narrative about their rise to power, and then Li Shimin's rise to power with an instinctive grain of salt, mostly because I know how clever and literary Taizong is.  Taizong's one of those people, like Duke Wen of Zhou who know the immortal power of words and the ability it have in the long eons later in shaping perceptions of whole realities. I know that for at least 3 instances he straight out exaggerated his own role in the course of events. So I have to act almost as a judge while listening to his tall tales. What a braggart he is! 1. In the much later history about the rise of Tang, written already after his ascension, he mentioned that it was him who instigated his father to rebel by framing him through his two advisors with the suggestion that they leak out his sexual indiscretions with Emperor Yang's concubines (a capital offense) thus blackmailing his father to rebel. It's pure rubish since Li was only 17 years old and it was his father's plan all along to unseat the Sui. Taizong inserted himself to suggest that the revolution has his genius little hand in it throughout. It's Taizong's own fanction, written by Taizong himself, and I cringe at it even 1500 years later reading it. 2. 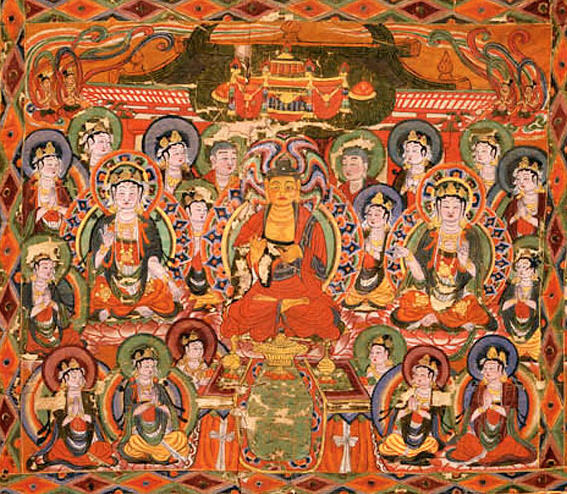 Taizong- despite releasing nearly all of the women from the harems after he took power as a gesture of sobriety and abstinence eventually refilled the harem to a level comparable to his father and Yang's reign later in his life. Which is a legitimate ground to call him out for being a hypocrite, or at least irresponsibly suggesting something too heroic that he didn't fulfill. 3. 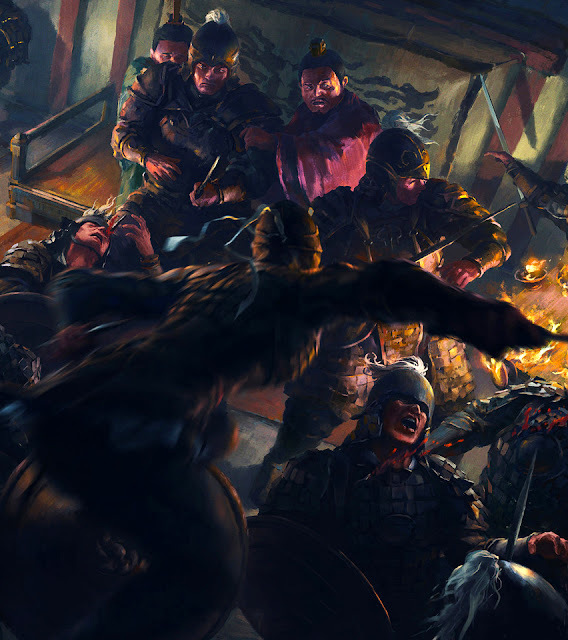 When the Gokturks invaded Tang after Li's coup, despite him recounting he had scored a hard fought but barely won victory which protected the realms, later after he crushed the Eastern Gokturk Khaganate he wrote that he had crushed the Khagan himself and revenged himself of the last humilation...which suggested that their first encounter was either a defeat or that Li had flat out paid tribute during parley and left in shame. Like I said before, Li Shimin is his own best propagandist, and knew the ethos and morality of his people well. He flattered scholars, teachers, and all able writers of his time and knew that because he was good to them, to expression and in a sense to liberal social policies he will be buttressed by them. He also knew that he is powerless to challenge some of the other critical part of his actions (such as killing of his brothers and forcing father to retire) thus he didn't try and just let people write about it. Ultimately, perhaps Taizong simply died before he was able to drop the ball and see himself become the villain. I had a feeling he might turn out to be one especially looking at his campaigns in Goguryeo which echoed that of Yang's policies to me. He died when he was still the visionary hero who came to the scenes and made a lot of lasting changes that turned out for the better in long term. Yang's tyranny was indeed exaggerated, but he was a hell of a mess of a ruler. The things that the Tang definitely exaggerated includes his abuse of harem women and his active disdain for the people, and the cruel lingering scenes of him executing officials and generals. When the Tang wrote of the Sui campaigns in Korean they made the Sui casualties to be over 1 whole million soldiers, though the number was still great and in several hundreds of thousands it was not close to a million, modern estimates in both China and Korea dismiss the million as Tang exaggerations. Same goes for the Tang's description of Sui atrocities against its officials. Simply put, that was the punishment for traitors, and if you are a general who rebelled, your clan is purged if they did not report it before hand. Yang maybe paranoid, but several of the people he removed could legitimately be said to pose a threat to him. A last note to defend him is that most of his mistakes are not out of his callousness or cruelty but the fact that he was surrounded by a deeply corrupt inner court that lied to him all way while also lying about the state of the empire, because they brokered the truth, any governors who they view as a threat were eliminated. Yang may have killed his father and is a tyrant in his hellish projects and forced levies but if he was truly ignorant, then its more their fault than his. That being said, Emperor Yang was greatly hated by the millions. Because of his court's cocoon of lies his policies were back-breakingly harsh across the realm, untold numbers would die from his projects, many cannot have enough to pay their taxes, and I have mentioned before that by his mid to late reign there were hundreds of bands of armed rebels composed of starving peasants across the whole of the realm (who he turned his army on.) Oh yeah, he was also recorded by Sui records to be constructing a dozen huge palaces that he doesn't even bother to live in. Compared to such utterly harsh and incompetent rulers its not surprising how the majority allowed the Tang to take power. When the Tang lowered the taxes, provided abundance and ultimately secured the boarders by contrast they looked like great heroes. 2. "Black Armored Guards" That's a good translation actually, Hmmmmmmm. Fortunately for Li Shimin the culture of China at that time is not so Confucian compared to later Dynasties such as the Song or Ming. And yes, the political norms of the time must be judged by the morals of the centuries before it than after it, and the situation before that period was rather relaxed in regards to fratricide. Both Northern Qi and Northern Zhou's rulers killed bothers, uncles, and fathers, and the rulers of the Southern dynasties killed whole clans before them to come to power (there are 4 such dynasties in succession after all.) And for the steppe cultures they don't find the topic taboo at all, the Gokturk civil war was a war of brothers vs brothers vs uncles. Turkic- Xianbei politics has always been such. There was also more of a concept of a keen "communal good" in northern China at the time similar to how the Goth saw themselves. Basically stating that if a community needs a leader it must have a strongman to fill the role for the good of the tribe. Sounds dictatorial to the modern mind but to "honor-cultures" they knew that a leaderless collective will be invaded by its vicious neighbors. All in all, China was shocked by it, same for Taizong's father, but it was not wholly unexpected. Before Taizong did it he was almost poisoned by his brothers in a banquet and was recorded to have vomited by the courtiers, Li Yuan advised him to stay away after that. Li's trusted general Yuchi Gong was also arrested without charges and tortured by Li Shimin's younger brother. Then they ordered the arrest and expulsion of Li's teachers, and general staff, then proceeded to give the Black Armored Guards to another commander, all the formalities before someone in their position would make their move. Truisms in Chinese history, if you are an Emperor and your adviser is asking for Nine-Bestowments, know that you will be killed and he would crown himself Emperor soon, if others are stripping of your ranks one by one, know that they will attack you personally next. Incidentally, the Gate commander at Xuanwu Gate was actually one of the Blacks, its little wonder he lent a hand to his former commander. 3. Yeah, Li was actually truly contemplating dual monarchies, something like Poland-Lithuania or Austro Hungary but in Asia. 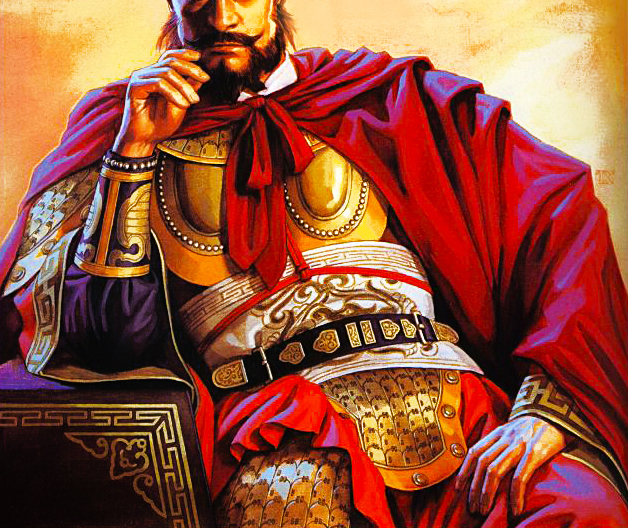 He would simultaneously be the Emperor of China while also Khagan of the Turkic nobles. I'm really not sure how that would work nor am I too fond of the European system of titles (I play wayyyy too much Crusader Kings 2 to know that I can "accident" and marry my way to rule a continent will collecting more titles than my Desmes would allow: -200 from nobles for having way too much titles) I rather like the proto- nation state conception of "国" meaning "state" or "nation" and have it not attached to bloodline but territory. Thank you for the in depth reply! Very informative indeed. I need to start supporting you on Patreon, let me take a look. To your knowledge did Li Shimin/Taizong Emperor use his Order of the Black Armored Guard the way the Ming used the Embroidered Uniform Guard or the Nazis used the SS? i.e. as a secret police? or was it a purely military unit used for war and a personal bodyguard like the Pope's Swiss Guard or Roman Praetorian Guard? And I agree with you regarding titles. There is no more greater title than 'Son of Heaven' and 'Emperor'. But I must disagree with you regarding "国" ... the proper character is "國", made up of a combination of "口" (mouth) representing The People and mouths to feed, and the radical from "戟" (halberd weapon of ancient China), representing The Army and defense, with the combination surrounded by a wall to represent the combination of walled settlement, people and army ... English words like 'nation' or 'country' or even 'nation state' are inadequate. The only Western word I know that conveys the true meaning of "國" is "πόλις" (Polis) from the ancient Greek. Polis did not merely connote territory but also lineage, remember you were a Citizen of Sparta, or Athens, or Argos ONLY if BOTH your parents were Citizens as well. So therefore the Chinese term for 'Citizen' should be 國人. And as you know all 國 have their origins in the Zhou Dynasty establishment. 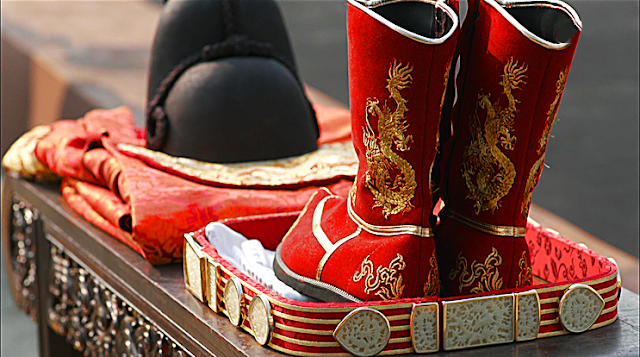 A founder of a 國 and his descendants would hold territory in vassalage to the Zhou King forever and ever. Many names of 國 of course became the origins of China's One Hundred Surnames, or simply The People. Ooo, I'd truly welcome your support as I am in between jobs and have to make ends meet by freelancing on an irregular basis. Any help is appreciated. As for the question of did Li use the Black Armored Guards as a paramilitary institution or secret police. No, the unit was eventually dissolved by the time Li Ascended to the throne as Taizong, before his ascension they were transferred to his brother's control, and after Li took power most of them were elevated into position of officers and generals. Quite a number of them eventually became key generals of Taizong's campaigns against the Gokturks and the Tarim Basins (Western Gokturk allies) several of the key warriors from the Blacks such as the swarthy Xianbei warrior Yuchi Gong and a few others won so many battles that they were made into door Gods (Menshen) in the Chinese Pantheon. *I wasn't kidding when I said that this unit actually made actual Gods.